For other uses of "Tafsir", see Tafsir (disambiguation). Tafsir (Arabic: تفسير‎, translit. Tafsīr, lit. 'interpretation') is the Arabic word for exegesis, usually of the Qur'an. An author of a tafsir is a mufassir (Arabic: مُفسّر‎; plural: Arabic: مفسّرون‎, translit. mufassirūn). A Qur'anic tafsir attempts to provide elucidation, explanation, interpretation, context or commentary for clear understanding and conviction of God's will. Principally, a tafsir deals with the issues of linguistics, jurisprudence, and theology. In terms of perspective and approach, tafsir can be broadly divided into two categories, namely tafsir bi-al-ma'thur (lit. received tafsir), which is transmitted from the early days of Islam through the prophet Muhammad and his companions, and tafsir bi-al-ra'y (lit. tafsir by opinion), which is arrived through personal reflection or independent rational thinking. There are different characteristics and traditions for each of the tafsirs representing respective schools and doctrines, namely Sunni Islam, Shia Islam, and Sufism. There are also general distinctions between classic tafsirs compiled by authoritative figures of Muslim scholarship during the formative ages of Islam, and modern tafsir which seeks to address a wider audience, including the common people. The word tafsīr is derived from the three-letter Arabic verbal root of ف-س-ر F-S-R (fassara, 'interpret'). In its literal meaning, the word refers to interpreting, explaining, expounding, or disclosing. In Islamic contexts, it is defined as understanding and uncovering God's will which has been conveyed by the Qur'anic text, by means of the Arabic language and one's own knowledge. The first examples of tafsir can be traced back to the Islamic prophet Muhammad. As the Qur'an was revealed to him, he recited the verses to his companions, usually explaining their meanings to teach them, as it was one of Muhammad's responsibilities. Elements of Muhammad's explanations including clarifying verses whose intents are not understood, the indication of names, places, times etc. which have not been mentioned in the verse, restriction of meanings which have been given as absolute and reconciliation of expressions which seem contradictory. Although scholars including ibn Taymiyyah claim that Muhammad has commented on the whole of the Qur'an, others including Ghazali cite the limited amount of narratives (hadith), thus indicating that he has commented only on a portion of the Qur'an. After the death of Muhammad, his companions (sahabah) undertook the task of interpretation, thus starting a new age in tafsir. Most of the sahabah, including Abu Bakr, refrained from commenting based on their personal views, and only narrated comments by Muhammad. Others including ibn Abbas used their own knowledge from the Arabic language to interpret the Qur'an. At this stage, tafsir was selective and concise regarding its coverage, and only certain words, phrases and verses were explained. The Qur'an was still not fully interpreted, and commentaries were not separated from the hadith collection nor written separately, mainly due to other occupations such as the collection of the Qur'an. By the time of the next generations ensuing the sahabah, scholars in the age of the successors (tabi'in) started using a wide range of sources for tafsir. The whole of the Qur'an is interpreted, and narrations are separated from tafsir into separate books and literature. Grammatical explanations and historical data are preserved within these books; personal opinions are recorded, whether accepted or rejected. During this time, a whole range of schools of tafsir came into existence in different scholastic centers, including Mecca, Medina and Iraq. Iraqi schools of tafsir came to be known for an approach relied on personal judgment aside from the transmitted reports, and Jewish apocryphal reports were also widely employed. Notable compilers on this age including Sufyan al-Thawri. Until this age, tafsir had been transmitted orally and had not been collected independently in a book, rather, they had been gathered by muhaddithun (lit. scholars of hadith) in their hadith books, under the topic of tafsir, along with other narrations of Muhammad. This indicates that tafsir, in its formative age, used to be a special domain within hadith. Widening of the scope of tafsir and emergence of mufassirun in the age of the successors lead to the development of an independent discipline of tafsir. Another relevant discipline is the science of interpreting the Arabic sentence. Ilm al-Ma’ani is the science by which one figures the syntax through the meaning of a sentence. Ilm al-Bayaan is the science by which one learns the similes, metaphors, metonymies, zuhoor (evident meanings) and khafa (hidden meanings) of the Arabic language. Ilm al-Badi’ is the science by which one learns to interpret sentences in which the beauty and eloquence of the spoken and written word are considered hidden. The above-mentioned three sciences are categorized as Ilm-ul-Balagha (science of rhetoric). It is one of the most principal sciences to a mufassir as it is deemed by Muslims that there are literal and non-literal meanings of the Qur'an, and one is able to reveal the miraculous nature of the Qur'an through these three sciences. A field from Qur'anic teaching is called Ilm al-Qira'at. This is a system of dialecticism of the different readings of the Qur'an. This science is important because one qira'at (way of reading) of the Qur'an may differ in meaning from another, and one learns to favor one reading over another based on the difference in the meanings. General sciences of Islamic theology and Islamic study are also imperative. Ilm al-Aqa'id and Ilm al-Kalam are comprehensive sciences in Islamic theology and philosophy. They are important because upon these understandings, one may understand issues such as invalidity of attributing the literal meaning of some ayah to God. In this case, one will be required to interpret the ayah as in ‘the hand of Allah is over their hand’. Other key issues required to be addressed through comprehension of theology and philosophy includes that of free will and determinism, or the infallibility of the prophets. Comprehension of Fiqh, Islamic jurisprudence, is important because one cannot gain an overview of any issue until he has understood its particulars. Usul al-Fiqh, principles of Islamic jurisprudence, is also required so one understands the methodology of legal derivation and interpretation. Other distinctive systems linked with tafsir study including Asbaab al-Nuzul, which is the field by which one learns the circumstances in which an ayah is revealed. It is important because the meaning of the ayah is more clearly understood once the circumstances in which it was revealed are known. Sometimes, the meaning of an ayah is wholly dependent on its historical background. Another is Ilm-ul-Naskh, which is knowledge of the abrogated ayah. In general, due to the Qur'an made up of revelations that revealed to Muhammad in the course of more than twenty years, certain verses are considered meant to be temporary and subsequently repealed by the following ones. Ilm-ul-Nashkh is a science of identifying the abrogations, and it is important because abrogated rulings must be separated from the applied rulings. Ilm al-Hadith is knowledge of the hadith which explain mujmal (general) ayah, and Ilm al-Ladunni is the endowed knowledge which is considered granted by God to his closest servants. This is for example a knowledge obtained directly from Allah through inspiration. They are the servants indicated in the hadith: "Allah will grant one who acts upon whatever he knows from a knowledge he never knew." There are several frames of reference in which tafsir can be categorized. The main issue of framing constitutes its methodology. Tafsir can be broadly divided into two categories from the viewpoint of methodology employed in order to approach the interpretation. These categories are called tafsir bi-al-ma'thur (Arabic: التفسير بالمأثور‎, lit. 'received tafsir', also known as tafsir bi-al-riwaya Arabic: تفسير بالرواية‎) and tafsir bi-al-ra'y (Arabic: التفسير بالرأي‎, lit. 'tafsir by opinion', also known as tafsir bi-al-diraya Arabic: تفسير بالدراية‎). Tafsir bi-al-ma'thur, or commonly known as tafsir bi-al-riwaya, is the method of commenting on the Qur'an using traditional sources. Tafsir bi-al-riwaya connotes tafsir using another portion of the Qur'an, or sayings of the Islamic Prophet Muhammad, or saying of his companions. This classical tafsir method is agreed upon by all scholars, and is the most used method throughout history, partly because other methods have been criticized. Criticism of non-riwaya method is mostly based on two grounds; for one, the Prophet has condemned those who interpret the Qur'an from their own point of view, and for two, most companions of the Prophet have refrained from presenting their own ideas. Some important examples of tafsir bi-al-riwaya are Jāmiʿ al-Bayān by al-Tabari and Tafseer al-Qurʾān al-ʿAẓeem by ibn Kathir. The sources used for tafsir bi-al-riwaya can be ordered by the rank of authority, as the Qur'an, Hadith, the report by Sahaba and Tabi'iun, classical Arabic literature, and Isra'iliyat. The most authoritative source of the interpretation is the Qur'an itself. Interpretation of the Qur'an employing other Qur'anic reference is very common because of the close interrelatedness of the verses of the Qur'an with one another. The Qur'anic verses explain and interpret one another, which leads many to believe that it has the highest level of authenticity. Many verses or words in the Qur'an are explained or further clarified in other verses of the Qur'an. One example of the hadith which extensively employs this source of method is Al-Mizan fi Tafsir al-Qur'an by Muhammad Husayn Tabataba'i. The authoritative source of method second to the Qur'an is Hadith, by using narratives of Muhammad to interpret the Qur'an. In this approach the most important external aids used are the collected oral traditions upon which Muslim scholars based Islamic history and law. Authority of this method is considered established by the statement made in the Qur'an that Muhammad is responsible for explanation and guidance. While some narratives are of revelation origin, others can be the result of reasonings made by Muhammad. One important aspect of these narratives is their origin. Narratives used for tafsir, and in general, must be of authentic origin (sahih). Narratives of such origin are considered requisite for tafsir. "The best people are those living in my generation, then those coming after them (Tābi‘un), and then those coming after (the second generation)". If nothing is found in the Qur'an or the Hadīth, the commentator has recourse to what the Ṣaḥābah reported about various verses. These are generally considered above personal opinion, because these people grew up with everyday interaction with Muhammad, and had often asked about the meanings of verses or circumstances of their revelation; and they were very knowledgeable in both Arabic literature and Islamic thought. Another non-scripture based source of the interpretation is classical Arabic literature. Classical Arabic poetry and the text of the Qur'an are two resources which can be used as foundational reference in ascertaining the meaning and signification of the remaining literal and figurative diction of the Qur'an and its style of expression. Using Arabic poetry for defining words is a long used practice, in fact there are very few scholars who haven't used this source. Less authoritative source of the interpretation is Isra'iliyat, which is the body of narratives originating from Judeo-Christian traditions, rather than from other well-accepted sources. The Isra'iliyat are mostly non-biblical explanatory stories and traditions (Hebrew: midrashim) giving extra information or interpretation about events or individuals recorded in the Hebrew scriptures. Scholars starting with the Sahabah have studied narrative accounts of other Abrahamic religions to further explain and clarify verses, especially parables, in the Qur'an. While some may be accurate, these narratives are not subject to hadith authenticity criteria, and are generally not favored for use. (This is) a Scripture that We have revealed unto thee, full of blessing, that they may ponder its revelations, and that men of understanding may reflect. "He who says (something) concerning the Qur'ân without knowledge, he has taken his seat of fire"'. However, this hadith can alternatively be interpreted to refer to the importance of first properly studying and learning the Qur'an before attempting to teach or preach it to others. Accordingly, the method of independent reasoning (ijtihad) has several qualifications and conditions that need to be satisfied. Due to the nature of orientation toward opinions, this method is rejected by certain scholars such as Ibn Taymiyyah, and prohibited by Wahhabi Islamic doctrine. Some important examples of such tafsirs include Anwar al-Tanzil by al-Baydawi and Mafatih al-Ghayb by Fakhr al-Din al-Razi. Some parameters used by these scholars including linguistic resources, historical sources, methodological concepts such as maqasid or socio-cultural environment taken into consideration. In terms of linguistic resources, literary elements of the Arabic language, including morphology, eloquence, syntax are an integral part of tafsir, as they constitute the basis of understanding and interpretation. Arabic has a systematic way of shaping words so one can know the meaning by knowing the root and the form the word was coined from. If any word can be given a meaning that is compatible with the rules of grammar, Qur'anic text can be interpreted that way. In terms of historical resources, scholars may choose to interpret verses according to external factors, including their historical context and their place of revelation. Historical context (Asbab al-nuzul) is particularly important to interpret verses according to how the Qur'an was revealed, when and under which circumstances, and much commentary was dedicated to history. The early tafsirs are considered to be some of the best sources for Islamic history. Classification of the place of revelation, whether it was revealed in Mecca or Medina, is important as well. This is because in general Meccan verses tend to have an iman (loosely translated as faith) nature that includes believing in Allah, the Prophet and the day of judgment, whether it be theological foundations or basic faith principles. On the other hand, Medinan verses constitute legislation, social obligations, and constitution of a state. On the more conceptual level, the idea of maqasid (goals or purpose) can be taken into account. Verses may be interpreted to preserve the general goals of shariah, which may be considered simply as bringing happiness to a person in this life and the hereafter. That way, any interpretation that threatens to compromise the preservation of religion, life, lineage, intellect or property may be discarded or ruled otherwise in order to secure these goals. Further, the socio-cultural environment may also taken into consideration. This includes understanding and interpreting the Qur'an while taking into account the cultural and social environment to which it has been revealed; or according to the scholars' own time. Often than not, the distinction can be made between the 'amm (general) verses that aimed at universal conditions for Muslims, and khass (specific) verses that applied to specific conditions, time or need. This is considered an integral part of analyzing the universality of the Qur'an. Scholars usually do not favor to confine verses to a single time interval, but rather interpret according to the needs of their time. Islamic theology is divided into myriad of schools and branches, and each of the schools comments on the Qur'an with their own point of view. 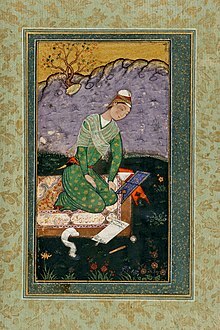 Mir Sayyid Ali, writing a Tafsir on the Quran, during the reign of the Mughal Emperor Shah Jahan. Regarding sunni tafsir, it seems that Muhammad ibn Jarir al-Tabari and Ibn Taimiyya serve as transition points. The time of Tabari marks the classical period, which encompased important Sunni tafsirs, such as Tafsir al-Thalabi, Tafsir of Al-Zamakhshari and Tafsir al-Tabari. Tafsir al-Tabari is one of the most important tafsir works in Sunni-Islam. This work provides exegetical material for the whole Quran, also contains conflicting information, which Tabari tries either to harmonize or argue in support of the one he feels more correct. Further he includes different readings, which according to him, both might be correct and given his own opinion after each argumentation. Both linguistical and theological subjects are discussed throughout his work. The post-classical period is marked by the exegetic methodology of Ibn Taimiyya and Ibn Kathir. Although ibn Kathir claimed to rely on the works of Tabari, he introduced new methods to for his exegesis, based on the teachings of Ibn Taimiyya. His monovalency and rejection of Isra'iliyyat are significant for his tafsir. It is much more selective, than previous tafsir. Intellectual disciplines of grammar, law and theology brought into debate did no longer played a role in Quranic exegesis. His straight approach is probably for its high regard in contemporary scholarship and is especially rewarded in Salafism. Tafsir by Shia Islam similarly deals with the issues concerned by Sunnis, and employs similar methodology as well, except for the adherence toward certain beliefs and creeds Shiism espouses. Distinctive features of Shia tafsirs include expounding of the concept of imamate, the heavier weight put on verses that considered to be the foundation of successorship to Muhammad within the Prophet's family begins with Ali, and the heavier authority put on interpretations attributed to The Twelve Imams. These characteristics result in distinction being made between the esoteric and the exoteric meaning of the Qur'an, and the esoteric meaning attributed to the imams preferred over the exoteric meaning. Certain Shia tafsirs are influenced by Mu'tazili thoughts as well, specifically on the theological issues. On the other hand, tafsir by Zaidi school of jurisprudence, which espouses the doctrine closest with Sunnis of all Shia sects, produces tafsir resembling Sunni tafsir in its quality. Some Zaidi tafsirs are considered popular among Sunnis as well. Some of the important examples of Shia mufassirs and its tafsir are Al-Tibbyan Fi Tafsir al-Quran by Shaykh Tusi (460/1067), and Majma al-Bayan lif'ulum al-Quran by Shaykh Tabarsi (d. 548/1153). The Mu'tazila tradition of tafsir has received little attention in modern scholarship, owing to several reasons. First, Al-Kashshaaf by al-Zamakhshari is the only traditional tafsir from the Mu'tazilite school which is available in a published form. It is narrower in scope than major tafsir works, concentrating mainly on grammar and language, and to some extent on theology. Secondly, several exegetical works by Mu'tazila scholars have been studied as books on theology rather than as works of tafsir. Thirdly, the large Mu'tazilite tafsir at-Tahdib fi tafsir al-Qur'an by al-Hakim al-Jishumi has not been edited, and there is no complete copy of it available at any single location, which limits its accessibility to scholars. The Ahmadiyya movement has published a number of Quran commentaries, these include Tafseer-e-Kabeer by Mirza Basheer-ud-Din Mahmood Ahmad (Urdu-10 Volumes) and Haqaiq al-furqan by Hakeem Noor-ud-Din (Urdu-4 volumes). Ahmadi interpretation of the Qur'an reflects their distinctive worldviews on Islamic philosophy and theology, such as rejection of abrogation of the verses and particular emphasis on harmony between the Qur'an as the word of God and science as the work of God. It is an interpretation of the Qur'an which includes attribution of esoteric or mystic meanings to the text by the interpreter. In this respect, its method is different from the conventional exegesis. Esoteric interpretations do not usually contradict the conventional (in this context called exoteric) interpretations; instead, they discuss the inner levels of meaning of the Qur'an. A hadith from Muhammad which states that the Qur'an has an inner meaning, and that this inner meaning conceals a yet deeper inner meaning, and so on (up to seven levels of meaning), has sometimes been used in support of this view. Islamic opinion imposes strict limitations on esoteric interpretations specially when interior meaning is against exterior one. Esoteric interpretations are found mainly in Sufism and in the sayings (hadiths) of Shi'a Imams and the teachings of the Isma'ili sect. But the Prophet and the imams gave importance to its exterior as much as to its interior; they were as much concerned with its revelation as they were with its interpretation. These are generally not independently written, however they are found in the books of Sufis. Some examples are Hakaik al-tafsir by Sulemi, and Tafseer-e-Rafai by Faqeer Syed Muhammad Rafai Arab. Scholars deeply influenced by the natural and social sciences followed the materialists of Europe or the pragmatists. Under the influence of those secular theories, they declared that the religion's realities cannot go against scientific knowledge. What the religion claims to exist, but which the sciences reject should be interpreted in a way that conforms with the science; as for those things which the science is silent about, like the resurrection etc., they should be brought within the purview of the laws of matter; the pillars upon which the divine religious laws are based — like revelation, angel, Satan, prophethood, apostleship, Imamah (Imamate) etc. - are spiritual things, and the spirit is a development of the matter. As for the Qur'an itself, one should not explain it in the light of the old philosophy and theories, because they were not based on observations and tests — they were just a sort of mental exercise which has been totally discredited now by the modem science. Found by Ghazali and built upon by Razi, it is one of today's most abundant way of tafsir. Common examples are Mafatih al-Ghayb by Fakhruddin al-Razi, and Tafhim-ul-Quran by Abul A'la Maududi. The philosophers try to fit the verses on the principles of Greek philosophy. If a verse was clearly against those principles it was explained away. In this way the verses describing metaphysical subjects, those explaining the genesis and creation of the heavens and the earth, those concerned with life after death and those about resurrection, paradise and hell were distorted to conform with the said philosophy. That philosophy was admittedly only a set of conjectures — unencumbered with any test or proof; but the Muslim philosophers felt no remorse in treating its views on the system of skies, orbits, natural elements and other related subjects as the absolute truth with which the exegesis of the Qur'an had to conform. Fiqhi tafsir deals mainly with verses that have a legislative meaning (see ahkam), and it strives to obtain Islamic law from the Qur'an. It is a very common school classically and modernly. There is a dispute over the number of verses that contain jurisprudence, numbers ranging from 5 to 200 are reported. Some works part of this school are Aḥkam al-Qur'an by al-Jassas, and Aḥkam al-Qur'an by Qaḍi Abū Bakr ibn al-'Arabī. A newer work which incorporates and quotes the work of a multitude of previous scholars and analyzes the relevant Arabic root words (based on all available classic Arabic meanings), and references all relevant passages of the Quran, was done by Abdul Mannan Omar. ^ a b c d e f g h i j k l m n o p q Mir, Mustansir. (1995). "Tafsīr". In John L. Esposito. The Oxford Encyclopedia of the Modern Islamic World. Oxford: Oxford University Press. ^ "The History of Tafseer". IslamicBoard - Discover Islam - Connect with Muslims. ^ a b c d e Allama Jalaludin, Suyuti (2008). الاتقان فی علوم القرآن. Darul Ishat. ^ Yusuf, Badmas 'Lanre. Sayyid Qutb: A Study of His Tafsir. The Other Press. p. 28. Retrieved 18 December 2014. ^ "The Hadith Book (48. Witnesses): nr. 819". Search Truth. Retrieved 2013-07-21. ^ C.E. Bosworth. Encyclopedia of Islam 2nd ed Brill. "Al-Tabari, Abu Djafar Muhammad b. Djarir b. Yazid", Vol. 10, p. 14. ^ "Tafseer Kabeer Mirza Bashiruddin Mahmood Ahmad" – via Internet Archive. ^ "The Holy Quran". www.alislam.org. ^ "Gallery - Tafseer-e-Rafai". sites.google.com. ^ Nooruddin, Allamah; Omar, Abdul Mannan; Omar, Mrs Amatul Rahman (2015-11-20). The Holy Quran - Exegesis of, Commentary and Reflections (1st ed.). Noor Foundation International Inc. ISBN 9781942043041. ^ "Tafsir (Commentary) of the Quran | Reflections and Interpretations of the Holy Qur'ân by Muslim Scholars". tafsirs.com. Retrieved 2018-07-29.